Too posh to push? do not want to go full term? planning an induction because you do not want to have a tear by a vaginal birth. Think of the premature baby and ditch it unless of an emergency or complication with your own body. 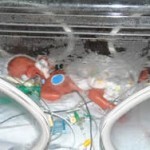 here are 5 important facts about premature babies that should make you change your mind. A 40 weeks gestation in pregnancy is for a reason. A baby born under 37 weeks is classed as premature and most likely will require specialist care in either a NICU HDU or SCBU. It means their tiny body isn’t ready for the outside world and will take a great deal of skill in order to keep it in a stable condition due to organ immaturity of vital organs. You don’t just give birth by c section then take a premature baby home in the afternoon for convenience.You don’t always see a premature baby after delivery as it may need to be whisked away to have vital tests and medicines. You may not get to hold a premature baby for days or weeks as they need a replacement womb to keep them constantly warm known as an incubator. You may only get to sit by baby’s cot side and stroke a tiny finger. You cannot play mum and take it for walks to the park as you would with a newly born full term baby. so please be wise and think is an elective C section really necessary.